I love these delightful six-sided ornaments and you can use any colors or photos you wish to make them. 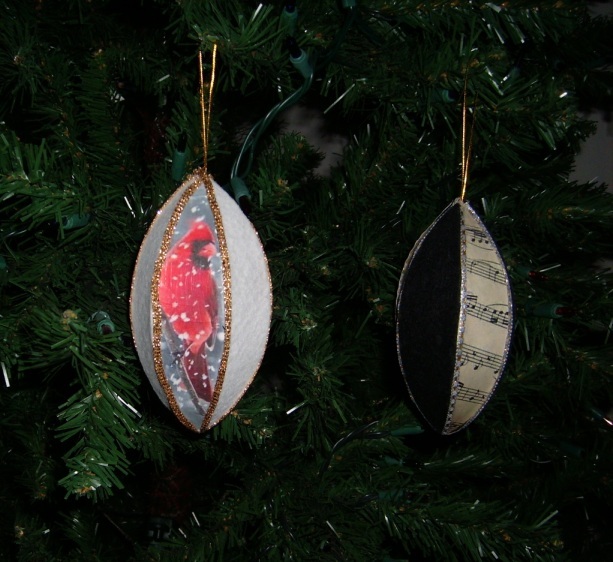 Here are two examples that I made for our tree this year. The base for these ornaments are six-sided paper mache forms I purchased online from Oriental Trading Company, on sale at 6 for $3.99, or about 67 cents each. They already have the hanging cords attached. I measured and made a template to cut the pieces of felt and photos. I used felt on three sides (I used the peel and stick variety) alternating with three copies of a picture I printed from my computer. I first glued the pictures on three alternating sides of the form. Once the pictures were in place, I used a small paintbrush to coat the pictures with a thin mixture of glue and water. Let dry overnight. I then applied the felt to the other three sides of the form. I then glued thin strips of decorative ribbon over each rib to cover where the sides join. Simple, yet elegant.